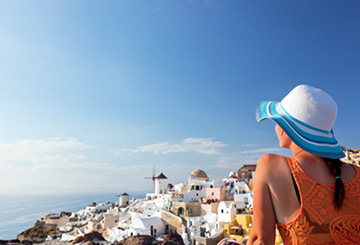 The summer months of June to August are the busiest for festivals around the world, with at least 72 in July alone! It's the peak period for music festivals, such as the likes of Glastonbury, Download Festival, Chicago Blues Festival, the Brooklyn Hip Hop Festival, the Festival International de Jazz de Montreal, Fuji Rock Festival, and Lollapolooza. There's even the Air Guitar World Championships in Finland! With so much to choose from, it's was hard to pick, but here's our selection of colourful, quirky and unmissable festivals between June and August. 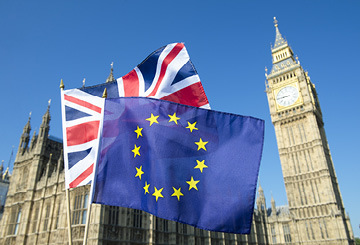 Whilst in Britain, we hope to see summer in June - and, in fact, the Summer Solstice is popularly celebrated at the mysterious, prehistoric Stonehenge, with a festival held between 18 and 21 June. However, in the Southern Hemisphere, it is the winter solstice, which is celebrated in Peru with a 9-day celebration worshipping the Incan god Inti. 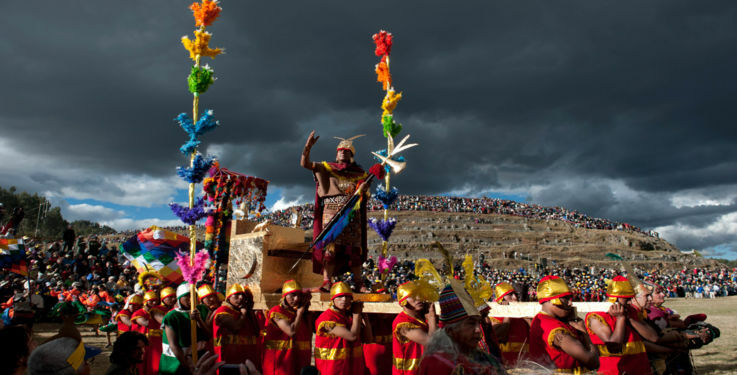 Inti Raymi or the Festival of the Sun, harks back to a time where the indigenous people believed that only fervent prayer, devotion and sacrifice could persuade the sun to return and bless the locals with good crops and fine health. Although the rise of Christianity in the 16th century saw a prohibition of the Incas' beliefs and practices, the celebration of Inti Raymi remained resilient, practised underground until 1944 when the government and church sanctioned it - today, it is South America's second largest festival. A week of concerts and street fairs leading up to the main event, and there's a focus on fun, so enjoy losing yourself in song and dance at the Plaza de Armas, and sampling the local cuisine - maybe even try cuy, or guinea pig, if you're a really adventurous eater! 24th June sees a throng of carefully selected actors - representing figures such as the Sapa Inca (Sun King), his wife Mama Ocllo, and others - gather at Cusco's Koricancha Square in front of the Santo Dominigo to begin their daylong rituals, drawing in the week's largest crowds. The Sapa Inca starts proceedings by delivering a traditional speech praising the sun, before being carried on a massive throne in a royal procession leading to Sacsayhuaman. You'll spot actors donning lavish jewellery and colourful robes, depicting the roles of priests and nobles from the traditional Incan hierarchies. As the procession proceeds to the fortress, the path is strewn with flowers, while women constantly ensure it is swept to keep evil spirits away. Once the congregation reaches Sacsayhuaman, there's another speech from Sapa Inca, followed by the representatives of the Suyos: the Snake, representing the underworld, the Puma, representing the terrestrial world, and the Condor, representing the Heavens. This is followed by a ritualistic sacrifice of a white llama, with the high priest holding the llama's beating heart up to honour Pachamama, to ensure a year of fertile and abundant crops - but don't worry, animals are no longer harmed in this ritual anymore. At sunset, there's a great fire and dance ritual to honour Tawantinsuyo, the Incan name for their territory, and, finally, the procession makes its long return back to Cuzco, holding the Sun King and Queen high atop their thrones. This is a wonderful festival to behold, transporting you back to a time of ancient beliefs and superstitions, resplendent with colours, and with a reverent yet jovial vibe. The Catholic celebration of Corpus Christi is a high holy day which celebrates the Eucharist, or the body and blood of Jesus Christ. This is celebrated by Catholics the world over, some in very distinctive ways! In Venezuela, people dress up like devils in fierce masks, dancing energetically around town squares - it can only be Diablos Danzantes, or 'Dancing Devils', a colourful rendition of the triumph of good over evil. 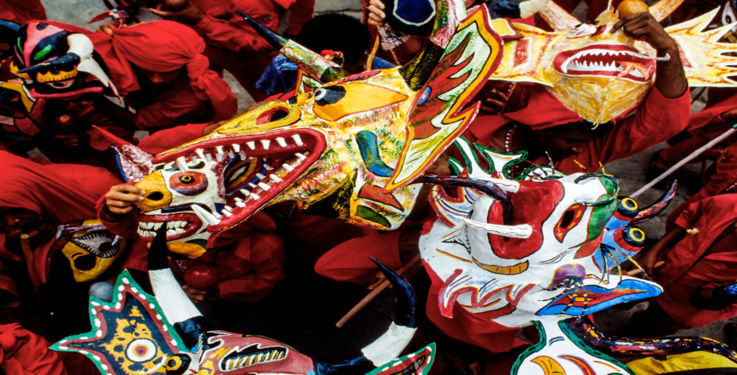 Each community has its own style of costume, with devils dressed completely in red and donning masks resembling winged dragons in San Francisco de Yare, in the state of Miranda, while revellers in the small town of Naiguatá, in the state of Vargas, bring an astounding level of detail to their costumes, which are more akin to works of art, with hand-painted trousers and shirts intricately decorated with crosses, devil faces, flames, geometric designs and other imagery, and colourful masks usually representative of marine animals, adorned with ribbons. Naiguatá is also one of the few places where women are allowed to join in the ceremonial dancing. Purple costumes and distinctly African masks are the hallmarks of the devils of Chuao. However, wherever it's celebrated in Venezuela, you'll see groups of Diablos Danzantes performing with maracas, whips, crucifixes and rosaries - all to ward off evil spirits - to the beats and rhythms of percussion and string instruments. A colourful parade heads to the steps of the local church, where the Sacrament has been laid out, and here the devils surrender to the sacrament, symbolising the ultimate triumph of good over evil. The dancers - or promeseros (promise-keepers) - belong to a community which passes on the oral history of this rich cultural tradition to future generations, and the whole community each serve to play their part in the traditions, with women preparing food, overseeing the progression of the rituals, raising altars along the parade route, and tending to the spiritual preparation of the children, to ensure a new generation of successors! With such a strong cultural identity and emphasis on community ties, it's no surprise that Diablos Danzantes is included on UNESCO's Representational List of Intangible Cultural Heritage of Humanity. Meanwhile, in Italy, Corpus Christi is celebrated entirely differently - but, nonetheless, colourfully. Since the 13th century, many Italian towns have held an Infiorata, or festival of flowers, but the largest and most renowned can be found in the town of Genzano, which dates back to 1778. Held for three days in June (the date is variable, depending on Easter), and centres on the town's main boulevard, the Via Belardi, which becomes carpeted by 500,000 flower petals, bloom and seeds arranged in 15 vivid panels connected by frames of green leaves. Each year, a theme is picked out - such as 'The Colours of Michelangelo - and once picked, hundreds of local residents spend days sorting and arranging hundred and thousands of petals, painstakingly using different types of flowers and plants to use as palettes for colours; carnations for red, broom for yellow, and so on. 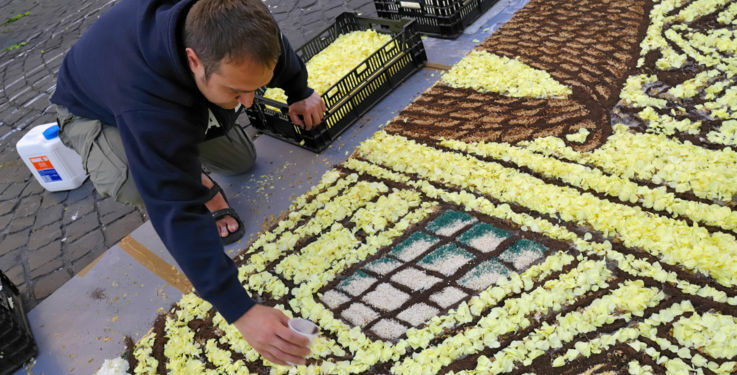 The festival's 'master' arrangers first draw the designs for each of the panels in chalk on the cobblestone pavement, and later groups of local residents are assigned to each piece, carefully filling in and laying the flowers in place. Stands are set up to offer souvenirs and local food products, such as olive oil, while a steady stream of visitors arrive in this small town to admire the flower panels, which cover 2,000sq meters. Be sure to taste the local pan casereccio, a rustic, crusty bread, and one of the EU's officially designated culinary specialties. On the Saturday, participants adorned in medieval and traditional costume accompany the priest on the Corpus Christi procession, proceeding over the carpet of flowers to the Church of Santa Maria. The end of the Infiorata, on the Monday after Corpus Christi, is marked with the traditional spallamento, where children run from the steps of the Church of Santa Maria, and across the flowers lining the Via Belardi, trampling the colourful images. Another month, another quirky Spanish festival...In fact, July features two unique festivals, which could only be held in Spain - El Colacho, or the 'baby jumping festival', and the famous Fiesta de San Fermin, more commonly known as the Bull Running in Pamplona. If you've just had a baby, head to the sleepy village of Castrillo de Murcia in northern Spain, the Sunday after Corpus Christi (although the festival date may change at the whim of the town! ), for an unique way to have your child blessed and their original sin removed by grown men dressed as the devil in snazzy red and yellow jumpsuits (paired with modern running shoes) jump over groups of babies swaddled in two rows laid out on comfortable bedding - about 10 babies can be blessed in one go. As they jump over the babies, the 'devils' lure away evil spirits and leave the babies pure. El Colacho dates back to 1620, although it has yet to receive the approval of the Pope and other senior church officials, who argue that baptism with holy water is the only way to purify children in the eyes of God. Despite this, new parents still like to participate - not that any one takes it too seriously - for its cultural significance, and because everyone they know in the village has experienced this centuries-old rite of passage, and so El Colacho continues its vibrant tradition, complete with musical processions whilst Beelzebeb chases both young and old, and teenagers dancing an Irish jig whilst donning lederhosen. Festivities begin a full week before the 'baby jump', with such Spanish festival staples as music, running through the streets, and feasting, while costumed members of the Brotherhood of Santisimo Sacramento de Minerva chase revellers with whips (you'll also see something similar in Pamplona's San Fermin festival). After the jump, the children are sprinkled with flower petals, and removed from the bedding. Then - of course - there's a parade through the streets of Castillo, concluding on the town's hilltop church, and finally concluded with a party, complete with copious amounts of local red wine! Whilst some of the newborns may be in tears - largely due to the commotion - and others may sleep through it in complete ignorance, we are happy to say that there has never been any serious injury to the babies during hundreds of years of baby jumping. 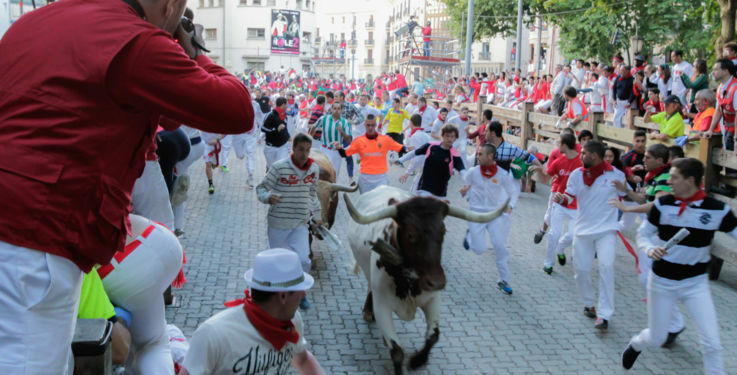 You may be more familiar with the world-renowned Fiesta de San Fermin, which originated as a week-long celebration of Saint Fermin, the region's patron saint who - legend has it - was dragged to death by bulls on Pamplona's streets, and the modern-day festival is an amalgamation of San Fermin's feast-day, an ancient trade fair, and a bullfighting festival. Running with bulls dates back to the 14th century, when cattle herders (known as 'locos' or 'mozos') 'ran with the bulls' down the winding narrow streets to the markets, which later transformed into a competition where herders tried to outrun the bulls whilst exhibiting daring acts of bravery. 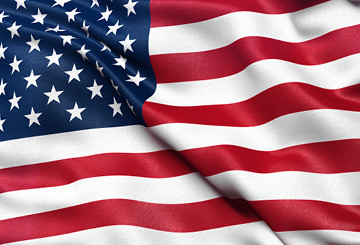 The first official event occurred on 7 July 1591, and it's been an annual fixture since. The launch of the Txupinazo rocket signals the start of the festivities at noon on 6 July on the Plaza Ayuntamiento, as an ecstatic crowd waits with anticipation, quenched with champagne bottles and red wine! And so begins nine consecutive days of partying, with a daily bullrun, a parade of the gigantes or cabezudos (big headed giants), a bullfight, fireworks, and fiestas, after fiestas, after fiestas! Over in Mongolia, for centuries Naadam - or 'Manly Games' - have been a countrywide sports festival pitting men (and women) against each other to measure strength and skill in the 'Three Games of Men': wrestling (men only), horse racing and archery, as well as a way for Mongolians to celebrate community, honour mountain gods and perform sacrifices. 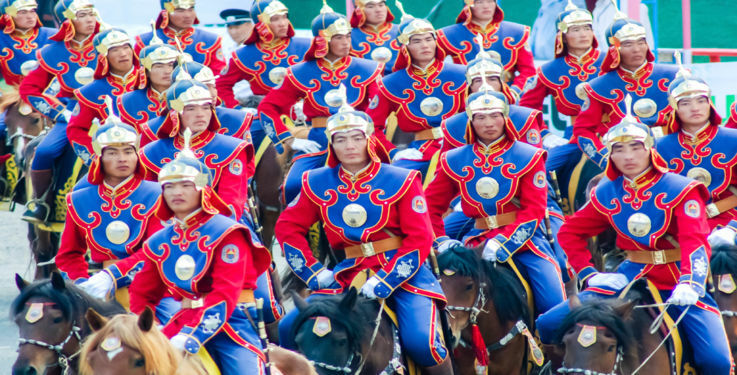 Originating as a celebration between clans and a showcase for weddings and other important gatherings, Naadam predates the mighty and infamous Ghengis Khan, who nonetheless presided over the first offical Naadam around the 13th century, and used it as a talent-scouting opportunity. The modern Naadam competitions are held annually from 11th to 13th July, commemorating the country's declaration of independence from China on 11 July 1921. The best place to witness Naadam is the capital, Ulaanbaatar, and you'll find a tented city of yurts (Hui Doolon Khutag) about 18 miles outside the city, which hosts the most dramatic horse races on courses about 9 to 12 miles long with jockeys aged between 5 to 13 years of age. Traditionally, the jockeys sing a song called ginko to their horses before the race for good luck, and you'll find that singing plays a key part in the festivities, with archers singing to their arrows for a straight flight in the archery competitions, while judges literally sing praises for successful shots. The biggest crowd attraction is the wrestling - matches have no time limit, no size classification, and fields of either 512 or 1,024 wrestlers compete in a single elimination tournament, dressed in the traditional wrestling costume which has an open front; legend has it that the costume must have an open front to ensure that only males are competing, after a woman once won in disguise. And of course, there's more singing, as each wrestler has their own zasuul to sing songs of praise. Whilst watching these spectacular competitions, be sure to try the traditional khuurshuur (cold meat pancakes), and try a little airag, fermented mare's milk. Forget the Henley Regatta, head to Darwin, Australia for an unique and unforgettable regatta as creative contestants handcraft boats out of recycled beercans and take to the seas at the Darwin Beer Can Regatta, a fun festival which does exactly what it says on the label! Embracing the spirit of gathering, drinking, and creativity, watch as some of the designs come completely undone before the race even starts, and cheer on those that make it a little further! Some of these 'can-structions' are amazingly well-put together over many months, and some are even sea-worthy! The whole month of July is a magnificent showcase of culture in Japan, with the Gion Matsuri held in Kyoto. Dating back a thousand years, and following a period of natural disasters and plagues suffered by Kyoto, its inhabitants believed the catastrophes were due to the gods of natural forces, and so sought to appease their inevitable wrath with purification ceremonies called Gouy-e, and these continued until the Ashikaga shogunate halted all religious gatherings in 1533. However, the plucky people of Kyoto fought to keep this much-loved tradition alive, and thanks to that the matsuri (festival) survived despite the ban. Throughout the month-long period, small festivals occur almost daily; the Byobu Matsuri (Folding Screen Festival) held between 14 and 16th July sees residents open up their homes to visitors, providing an unique insight into traditional Japanese homes during this citywide house party. The Kencha Matsuri (Tea Ceremony Festival) is another must-see, as is the Hanagasa Junko, or Flower Umbrella or Hat Procession, where you can admire hundreds of bouquets of flowers crafted into ornate headwear displays. However, the piece de resistance of Gion Matsuri is the Yamaboko Junko parade, where giant wooden floats - assembled in the traditional Japanese way without nails - form the parade, divided into two categories, the smaller Yama, and the gigantic Hoko, fixed on wooden wheels, and sometimes built to such dimensions that forty men are required to pull them through the winding streets! Each float is considered to be a moveable museum of history - so make sure you bring your camera - and because of these incredible floats, the Yamaboko Junko was added to UNESCO'S Intangible Cultural Heritage of Humanity list in 2009. 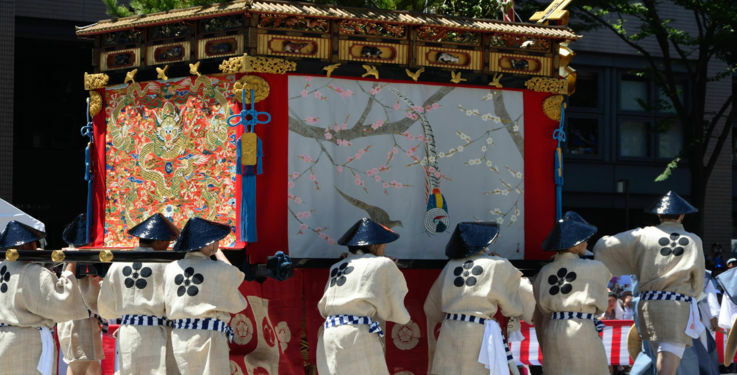 The highlight of this parade is the chigo, one young boy specially chosen to act as the deity's sacred page, who sits high atop the Naginata Hoko floats, adorned in floating Shinto robes and crowned by a golden phoenix. The chigo must cut a sacred rope called the shimenawa with a single slice of his sword - and must be spiritually purified in the weeks leading up to the special event, and is locked away from virtually all contaminating influences (including women) in the weeks leading up to the festival, and once in position on top of the float, he must not touch the ground! The Yoiyama festival leads up to the Yamaboko Junko parade, and gives attendees the chance to get up close and personal with the parade's floats, some of which are shrines dedicated to gods of health, wealth, and other worldly benefits, and buying an omamari (good luck charm), you might be able to channel the deity's benevolent powers. In the Austrian city of Linz, talented street performers take to the streets for three days each summer for one of Europe's biggest street-performance festivals, the renowned Pflasterspektakel (literally, 'pavement spectacle'). Dating back to 1987, the first event was a rousing success and has continued ever since. The epicentre can be found at the Hauptplatz, where over 200,000 spectactors visit to watch as colourfully costumed artists perform, from dancers, musicians, mimes and clowns, to acrobats, fire twirlers, and hire-wire walkers. It's great for families too, with the offshoot Kinderspektakel especially suited for children. As August approaches, head to the Caribbean to enjoy Antigua's Carnival, a celebration of the emancipation of slavery. An annual event held from the end of July to the first Tuesday in August, it's a ten-day flurried frenzy of colourful costumes, beauty pageants, talent shows and good music, with a J'ouvert its main event, where brass and steel bands perform for much of the island's population. A similar carnival - the Caribana - is held in Barbuda in June, while Grenada also holds an annual 'Spicemas', celebrating the Caribbean musical styles of soca and calypso, and attended by thousands of revellers, who flock to enjoy the pan drumming, the Carnival Queen Beauty Pageant and the J'ouvert celebration. 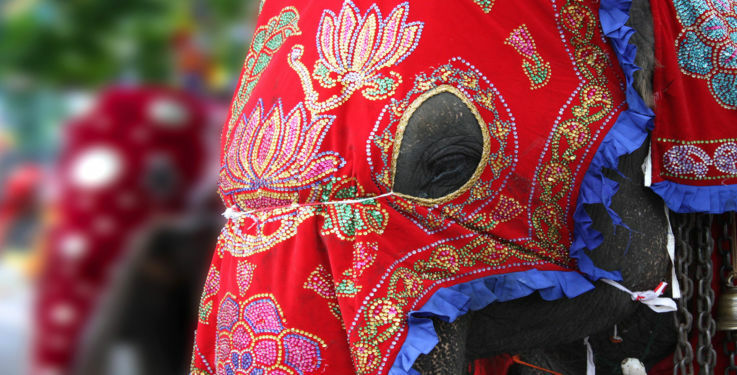 Described by D.H. Lawrence as a 'perpetual fire-laughing motion among the slow shuffle of elephants', the Sri Lankan festival of Esala Perahera honours the tooth relic of the Buddha in a whirl of decadently dressed dancers, perpetual drumming, the intoxicating fragrance of incense, and - of course - elephants. Legend has it that the Buddha's teeth were stolen from his funeral pyre 1,700 years ago and smuggled into Sri Lanka, where it is now housed in the country's most sacred temple, Dalada Maligawa (Temple of the Tooth). Today, Esala Perahera incorporates Hindu deities into its festivities, and there's a parade for every night of the ten-night festival, so you'll be sure to experience more than one sensual spectacle, from the aromas of wafting incense, jasmine and frangipani bouquets, the exotically costumed dancers and elephants, the cracking whips (to scare away demons), and the fire eaters. It all begins with the ceremonial cutting down of a jack tree to bless the festival, and it starts off with intimate gatherings at shrines and small processions for the first five nights (Kumbal Perahera) before building up for the latter part (Randoli Perahera), getting ever more energetic. Just wait for the arrival of Maligawa Tusker, a carriage carrying a replica of the Buddha's tooth, heralding a parade of elephants. Another highlight of this festival is the 'water cutting' ceremony through the Mahaweli Ganga River, symbolising the divide between pure and impure, and honouring the water goods for a good year ahead. Every year, a goblet of water from the ceremony is stored and used in the following year's tree-planting ritual, in an eternal circle. Japan's most important religious holiday, Obon is based on the Buddhist belief that the gateways to Heaven and Hell open on the fifteenth day of the seventh month, allowing spirits to visit the living world. Originating from the story of Buddha's disciple Mokuren, who used his supernatural powers to check on his deceased mother, only to find that she had fallen into the realm of the hungry ghosts - often viewed as a parallel world of suffering endless hunger and populated by those who were greedy in their lives (and in the afterlife suffer insatiable hunger for one particular object), and those who, when alive, were selfish, and now only have an appetite for the dead. Mokuren was understandably distraught at his mother's fate, and Buddha suggested he should pray to a group of monks, who were returning from a summer pilgrimage on the auspicious 15th day of the 7th lunar month. Following Buddha's advice, Mokuren's prayers were answered, and his mother was released from the realm of the hungry ghosts, and Mokuren, remembering his mother's acts of kindness, danced for joy (today this is replicated by the exuberant Bon dance, one of the festival's most lasting cultural symbols). To this day, Mokuren's story lives on, with people returning to their hometowns to adorn their ancestors' graces with flowers, and joyful dancing. During Obon, you can admire the beautiful ritual of releasing toro nagashi (floating lanterns), which people float onto the ocean, rivers and lakes, carrying their ancestors' spirits back to the afterlife, or watching the role fire plays in purification ceremonies. Some of the customs of Obon have later origins, dating from 1586; Obon's rowdy street dancing originates from a feudal lord hosted an epic sake-drenched party to inaugurate the Tokushima Castle. One of Obon's other famous dances, the Awa Odori dance fuses the Bon Odori dance and the story of the Tokushima Castle party, with steps imitating the irregularity of a dancer who's had one too many drinks! For snorkelling with a difference, head to the Welsh town of Llanwrtyd Wells, once a popular destination for spa breakers in the 18th century. Today, get on your wetsuit (no monofins allowed, mind), goggles, snorkel and flipper, and race along two lengths of a 60yard trench cut through peat bog for the World Bog Snorkelling Championships, an annual event held in August, which has been included in the World Alternative Games. With no rest between both lengths, if you don't think you can manage that, sign up for the Novelty category instead, and swim only one length! On 31 August, one of the most famous Spanish festivals is held: La Tomatina, a frenzied tomato fight in the town of Bunol, which was borne from a spontaneous fruit fight at the 1945 Los Gigantes festival, and today attracts thousands of participants, singing and dancing in the streets, eagerly anticipating the start of the festival as the church bell strikes noon, chanting 'To-ma-te! To-ma-te!' Shortly after noon, a blast of a rocket announces the commencement of the tomato fight, and there are only a few rules: tomatoes must be squashed before being thrown, no other projectiles are allowed, participants must give way to the trucks and lorries, T-shirts must be worn throughout, and no tomatoes can be thrown after the second shot fires. If you're interested in immersing yourself in the fun and festivities of any international carnivals, why not contact one of our dedicated travel specialists today?